Despite rapid urbanisation, developing countries are predominantly rural, with more than 55 per cent of the world’s population living in rural areas (IFAD 2011: 3). At least 70 per cent of the world’s very poor people—that is, those living on less than US$1.25 a day—and those with the most insecure livelihoods are rural people (IFAD 2011: 3). While the structural disadvantages associated with rural spaces, such as disparities in access to basic health, education and other services, are widely documented (Sen 1999), insufficient attention is given to how and why these disadvantages are amplified once disability is brought into the picture. 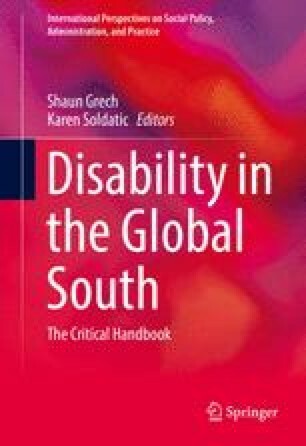 Limited research examines the intersections between rurality and disability, and the diversities and forms of disadvantage that emerge with this spatial relationship.